I have been super busy getting the new membership site finished up so I haven’t been blogging much. But I’ve been creating new recipes for the new site, which I am so excited about. This is one recipe I recently came up with and they are really delicious, at least that is what people tell me – I am still on Intro and eggs so far are not working for me… Here you go, I hope you enjoy the recipe! 1. Preheat oven to 375 F. Sift the coconut flour into a medium sized mixing bowl, and then add the baking soda, cinnamon and salt. 2. Melt the coconut oil in a small saucepan, and then combine the eggs, coconut oil, honey, vanilla, grated carrots, and pineapple in another mixing bowl. 3. Fold the wet ingredients into the dry and mix until combined. If dry, add a little more melted oil or water to the mixture. Fold in the walnuts and raisins. 4. 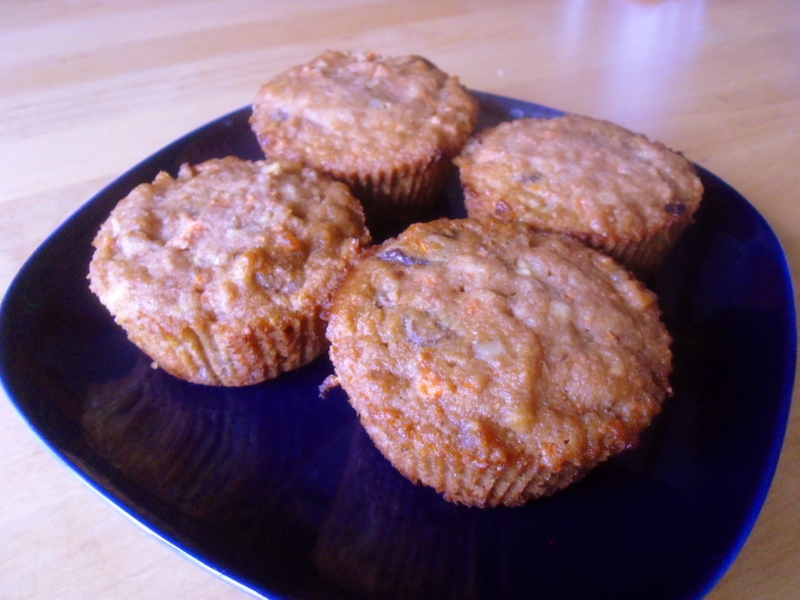 Use muffin papers or grease 14-15 muffin tins with coconut oil. Place about 1/4 cup batter into each muffin tin. 5. Bake at 375 for about 20-25 minutes or until muffins are lightly browned, cooked through and a toothpick come out clean when inserted into the middle of a muffin. These muffins look really good! Thank you for your recipes and your menu planners. So far they are VERY helpful for my family. Our middle daughter was diagnosed with Celiac Sprue in August, 2010, and she’s still not feeling better, so we’re attempting the “dairy-free, nightshades-free” diet. It was a daunting task until my youngest daughter, age 16, found your site. To say it was a relief, a God-send in fact, is no exaggeration! Thank you! I’m so happy to hear the menu planners are helping with your daughter’s diet. I hope you try the muffins – I had a little nibble and they tasted very yummy! Thanks so much for the recipe! I made these today and they turned out great!